FILE - A U.S. border patrol agent escorts men being detained after entering the United States by crossing the Rio Grande River from Mexico, in Roma, Texas, May 11, 2017. U.S. Attorney General Jeff Sessions on Friday announced a “zero-tolerance” policy on illegal border crossings into the United States, directing federal prosecutors along the southern border to take up all cases of illegal entry referred by the Department of Homeland Security. In a one-page memo, Sessions urged U.S. Attorneys in the border states of Arizona, California, New Mexico and Texas “to adopt immediately a zero-tolerance policy for all offenses referred for prosecution” under laws that make it a crime to enter the United States without proper documents. Late Friday, President Donald Trump signed a memorandum ordering an end to the policy known as “catch and release.” Under the policy, illegal immigrants are released from detention while awaiting a court hearing. Trump had made ending the policy a campaign promise during the 2016 U.S. presidential election. 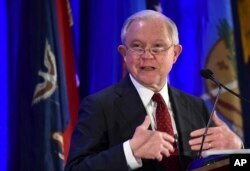 FILE - Attorney General Jeff Sessions delivers remarks to the National Association of Attorneys General at their Winter Meeting in Washington, Feb. 27, 2018. Last April, Sessions sent a memo similar to his Friday memo to U.S. Attorneys around the country, asking them to expand immigration prosecutions. But the directive gave them a measure of discretion in bringing criminal charges against an unlawful border crosser. “This time it’s clear that any referral from DHS needs to be prosecuted to the extent practicable,” a Justice Department official explained, speaking on condition of anonymity. In announcing the new policy, Sessions cited Department of Homeland Security data released Thursday showing a 203 percent increase in illegal border crossings from March 2017 to March 2018 and a 37 percent increase from February to March of this year — the largest month-to-month rise in seven years. The new policy is the latest initiative Sessions has announced as part of what he last year termed the “Trump era” in immigration enforcement. FILE - United States National Guard troops patrol along the U.S. and Mexico border in Nogales, Arizona, Oct. 8, 2010. 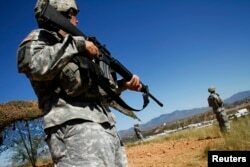 President Donald Trump on Wednesday signed a proclamation directing the National Guard to deploy to the Mexican border to fight illegal immigration. Trump said Thursday that he would deploy 2,000 to 4,000 National Guard troops to the border and keep them there until a border wall is built to keep out illegal border-crossers. The National Guard is under the dual control of state and federal governments. To deploy the troops, Trump needs the states’ consent. The Republican governors of Arizona, New Mexico and Texas have backed the planned deployment, but California’s Democratic governor remains undecided. This story was written by VOA's Masood Farivar​.